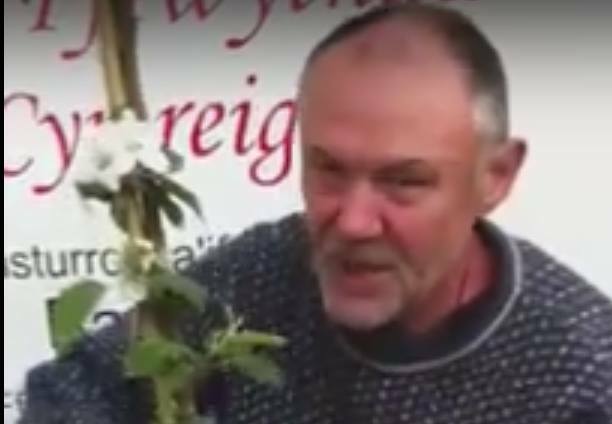 In this video Welsh fruit tree specialist nurseryman Ian Sturrock covers the points to look for when buying a fruit tree. He covers what you need to know when buying a tree online or mail order as well as when buying a fruit tree from a nursery or garden centre. Bare rooted trees, that is trees that arrive without being in a pot – the roots just wrapped in film, are best bought and planted when dormant. That is from November to early March in the UK. Usually bare-rooted trees are maidens – trees in their first year that are effectively a long stick without any branches. These are more suitable for windy locations as the tree roots anchor it firmly before the branches develop giving purchase for the wind to rock the tree. Pot grown trees where the plant arrives in a pot with soil around the roots can be planted out at any time of year. They will need staking in windy conditions. Avoid trees older than 2 years in pots as they are most often pot-bound and will be difficult to get established in the ground. When buying a fruit tree in a pot, or any tree in a pot for that matter, check these points. Check it’s not bound in with cling-film under the pot – that’s often the sign the tree has been field grown and moved to pot with damage to the roots. Lift the tree from the pot to check root condition. Check the tree is labelled and the label states the pollination group. This is very important when buying a fruit tree that isn’t self-fertile. The label should also tell you what rootstock the tree is on and how large it is likely to grow. Ian Sturrock is an expert on Welsh fruit trees. As someone who grows and sells trees for a living he knows what you really need to know when buying a fruit tree. He re-discovered and saved the Bardsey Apple from the Island of Bardsey off the coast of North Wales. He supplies a large range of unusual Welsh varieties of apple and other fruit trees from his nursery near Bangor, Gwynedd.